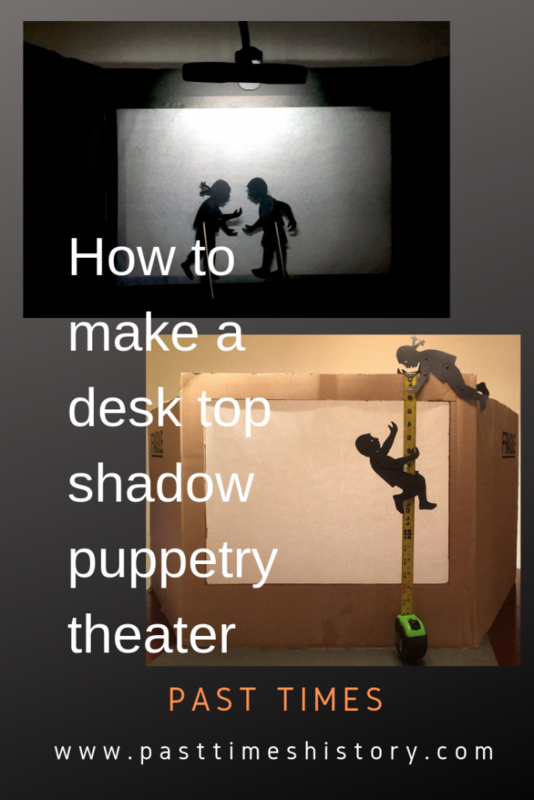 The principle of shadow puppetry is simple: you move flat puppets behind a light source and a screen, so that the audience at the other side of the screen only sees the shadows. The templates for puppets provided are made for desk top puppetry, in which puppets fit on a sheet of printing paper. For group or class performances with larger audiences you will need bigger puppets, larger screens and stronger lights. Choose a light source that is convenient and bright enough for the screen that you use. For desk top size screens with parchment or tracing paper or vellum in front of a window daylight will do. When it is darker use a a clip on desk lamp, book light, or cell phone light and keep the room as dark as possible.